We got the foundation wall makeover finished, and I love how it turned out! 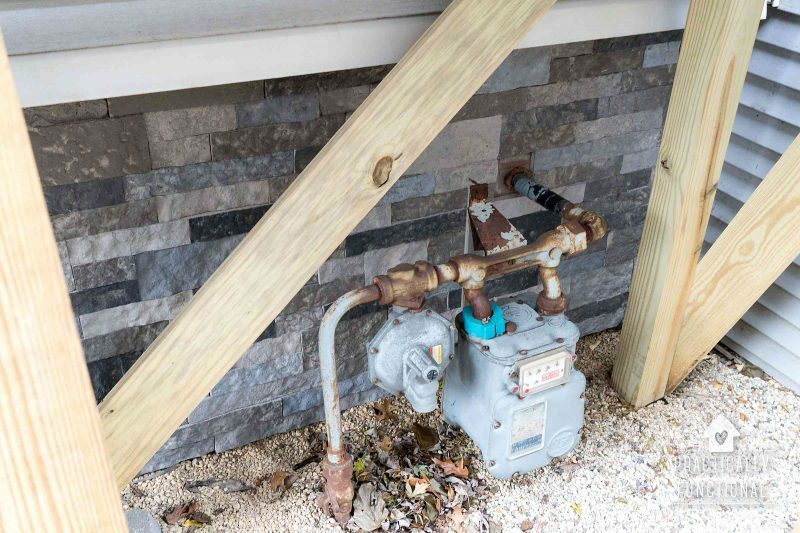 We covered the plain foundation wall with AirStone in the Spring Creek color (a mix of grays, shale, and charcoal). 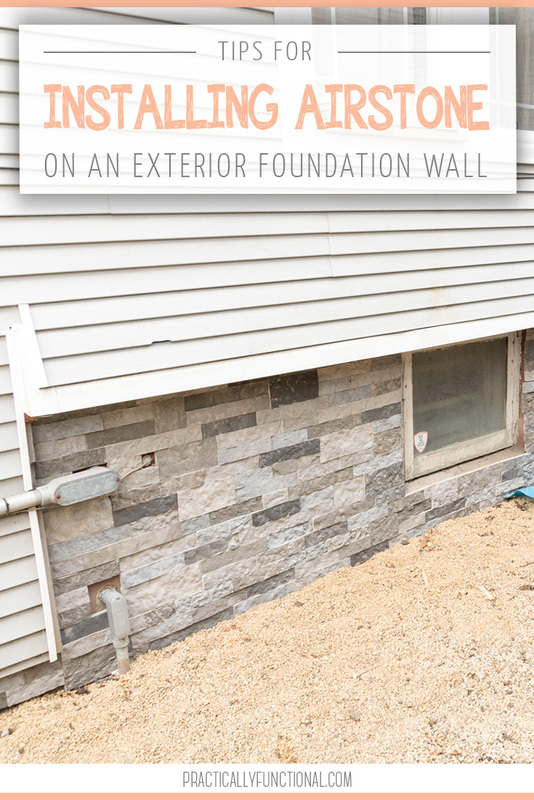 It was such a simple project, so today I’m sharing tips for installing AirStone on an exterior foundation wall. We used AirStone, a gorgeous, ultra-light stone wall covering product that looks and feels just like real stone, but weighs 75% less! 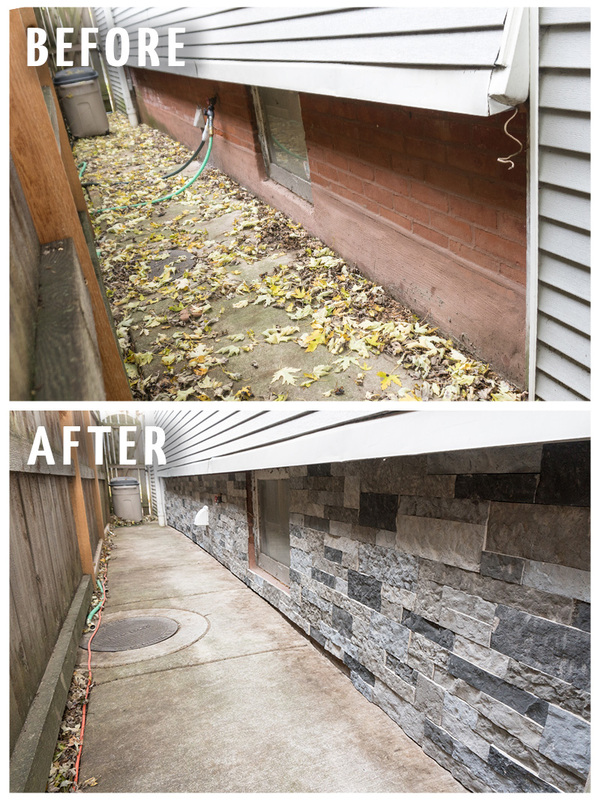 Our foundation wall makeover was obviously an exterior project, but you can use AirStone indoors as well. 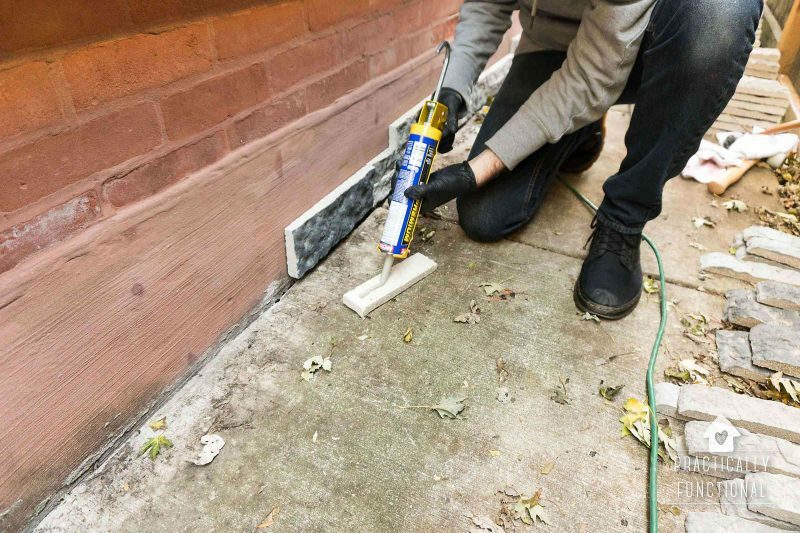 For outdoor projects all you need is construction adhesive, and indoors you just need a pre-mixed adhesive and a putty knife. If you need to cut any pieces to size or shape, AirStone cuts really easily with a hacksaw, so getting a gorgeous stone look is actually a pretty simple DIY project! The first thing we did is unpack a few boxes of stone. The stones come in multiple colors and lots of different shapes and sizes, so we sorted out the stones into piles so we could easily “randomize” as we put them on the wall. Make sure your surface is clean, dry, and free of dust and dirt. Our foundation wall was covered in dirt and dust, especially down near the bottom of the wall, so I took a rag and wiped it clean. 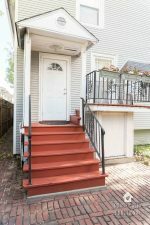 In terms of actually installing the stone, it’s super easy! Apply a line of construction adhesive to the back of the stone, then stick it on the wall! Once we placed the stones on the wall, we shifted them around a bit to help spread the adhesive out over the back of the stone, then shifted them into their final position. Because they’re so lightweight, they stuck to the wall immediately without sliding down or anything. If you have a second person to help you, the project goes way faster! My husband helped me install the AirStone, and it was definitely the easiest project the two of us have ever done together! My husband is not really a “project” kind of guy, but he is always willing to help me out when I need it, cuz he’s a sweetie. I was in charge of figuring out the “random” pattern and what size and shape stone would fit on the wall next, and he grabbed it, glued it up, and handed it to me. 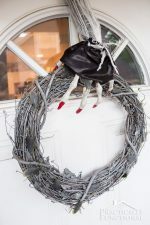 It was a really easy 2 person project. But if you are doing it by yourself, don’t worry! I finished up a few sections of wall on my own while JM was at work, and it is totally doable by yourself! The best way to start the whole project is to start at the bottom. 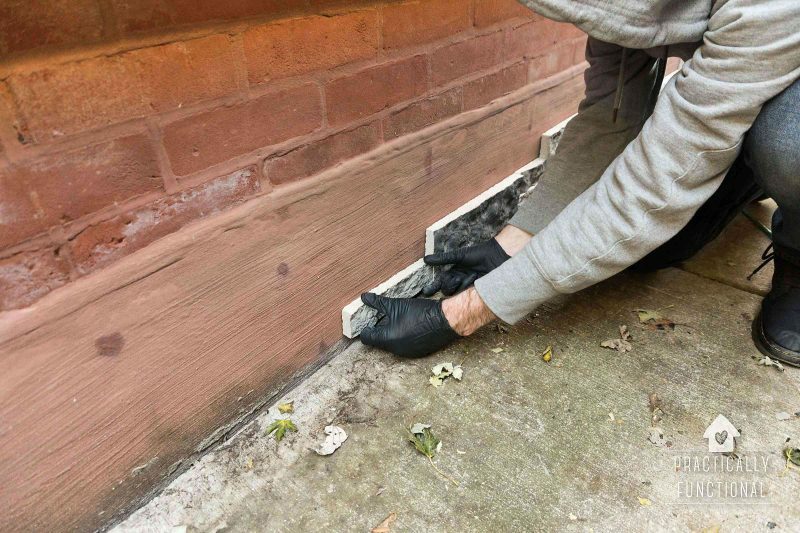 You want to leave about half an inch of space at the bottom of the wall in order to leave room for the wall to expand and contract as the weather changes. 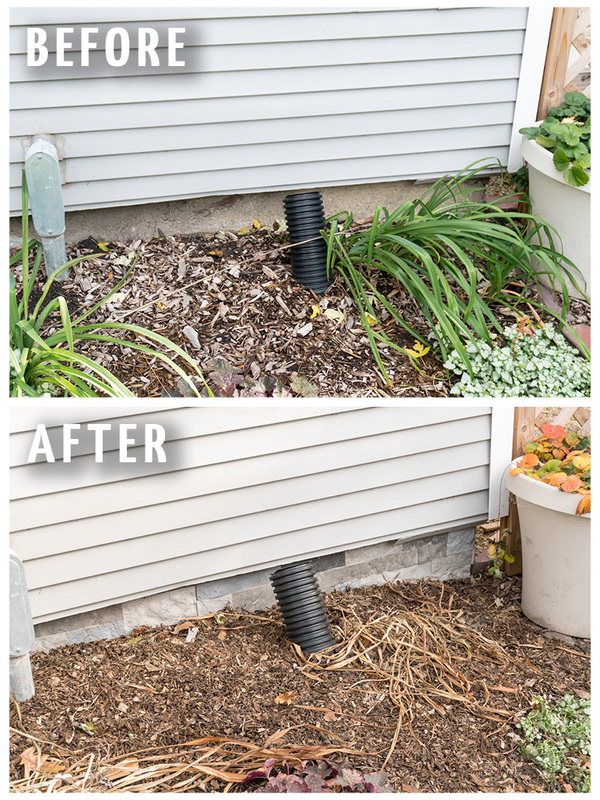 You can always cover up the gap with mulch or dirt once the stone is installed. If your wall has corners, don’t worry! AirStone has corner pieces that make corners and finished edges super easy! 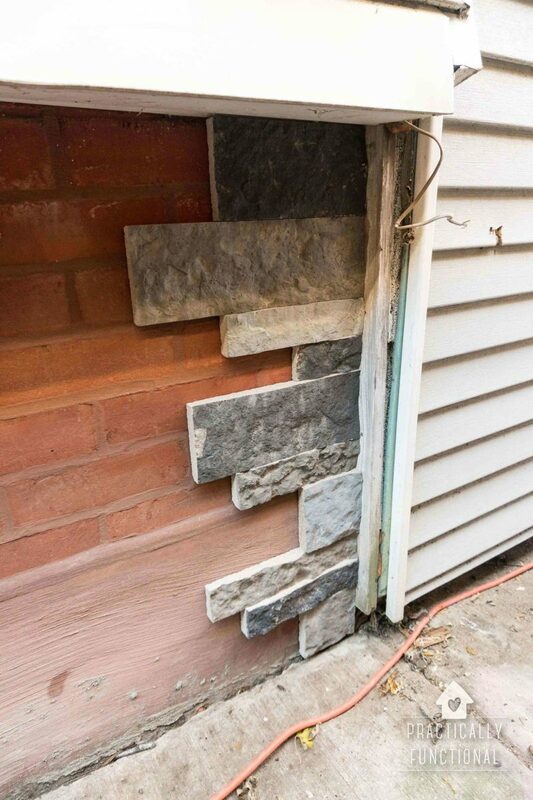 If you want the stone to go around corners, start applying the stone at the corner. That way you can make sure that the corner pieces line up perfectly. If you get to the other end of the wall and need to cut a few pieces down to size to make it all fit, no problem. The foundation wall goes all the way along behind the DIY rain barrel stand my dad and I built earlier this year, but we had no problem installing AirStone behind the stand. 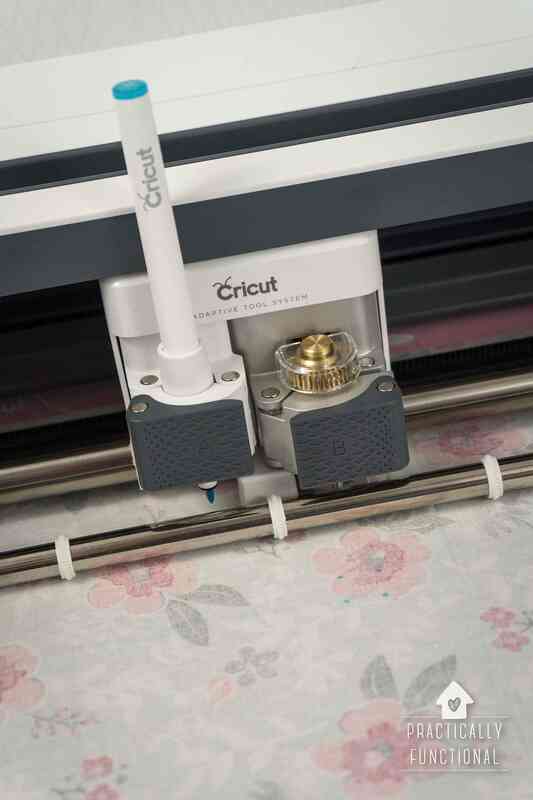 It comes in individual, pre-cut pieces that fit together perfectly and can easily slip in behind the posts. But the other thing we had to contend with behind the rain barrel stand was the gas meter. Luckily it is extremely easy to cut AirStone using a hacksaw. Just measure and mark the stone, and start cutting from the front/textured side of the stone. 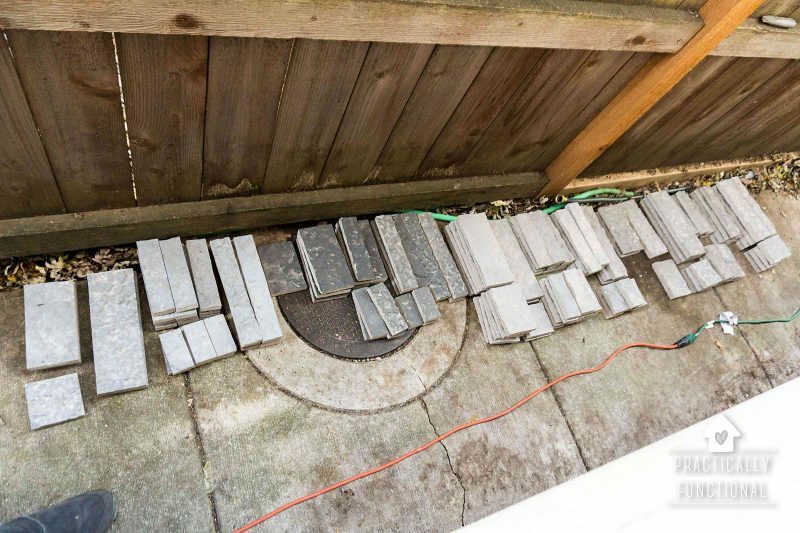 We had no trouble cutting a few stones to fit in tight spaces. We also cut a few pieces to fit around the areas where the electrical wires come into the house. 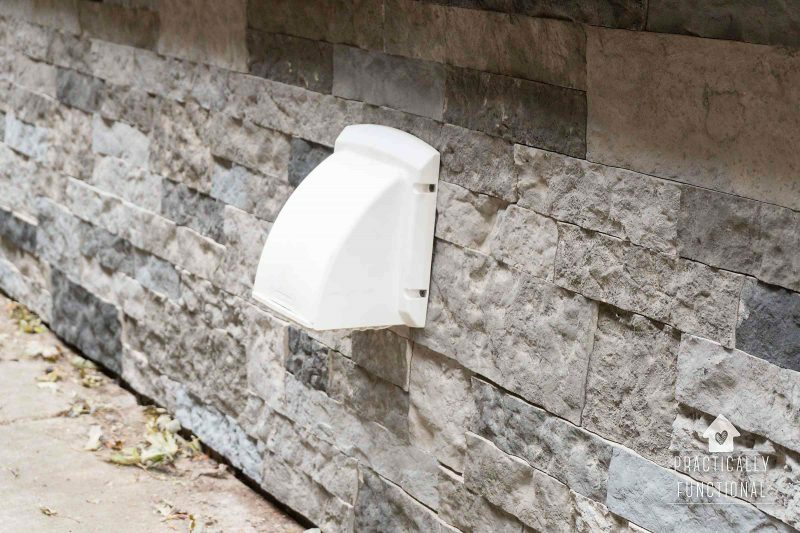 While we cut a few pieces of stone to fit around larger fixtures in the wall like the gas and electrical inlets, you can always install fixtures on top of the stone if you wish. 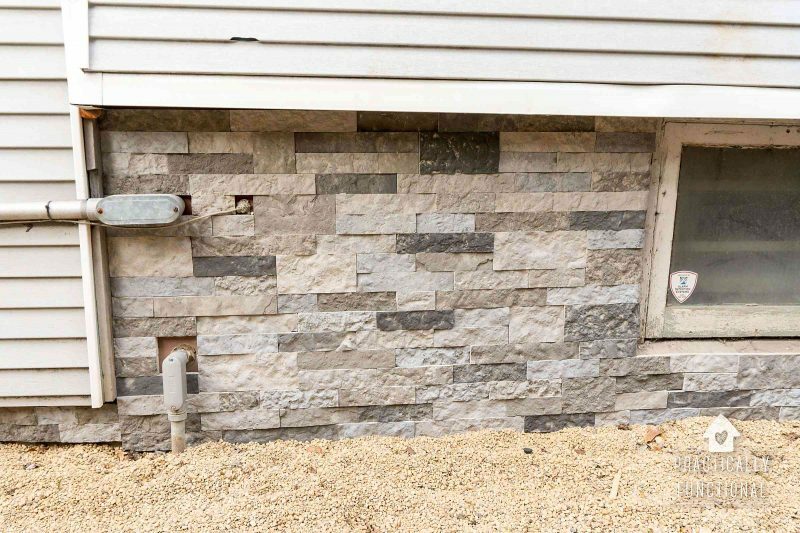 There’s a dryer vent on the foundation wall, so we installed stone up to and around the vent opening, then installed the dryer vent cover over top of it once the stone was fully cured. It’s easy to drill through AirStone, so I just drilled a few pilot holes and then attached the dryer vent cover using a few screws. 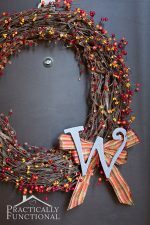 For indoor projects, this means you can easily hang artwork etc. on top of the stone after it has fully cured. 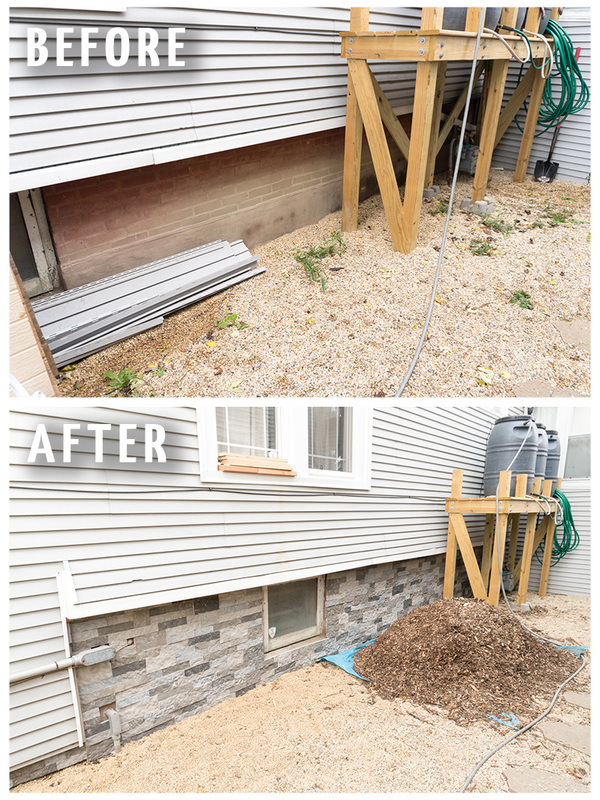 I’m so thrilled with how the foundation wall makeover turned out! 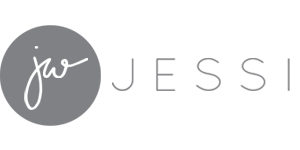 You can find AirStone at Lowes, and if you’re looking for some inspiration, or how-to videos using AirStone, you can check out the AirStone Inspiration website here. 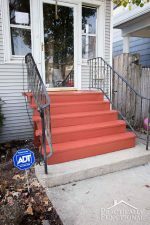 Our Back Steps Mini Makeover! 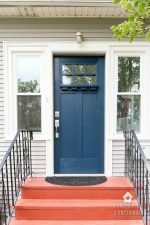 How To Paint A Door The Easy Way!